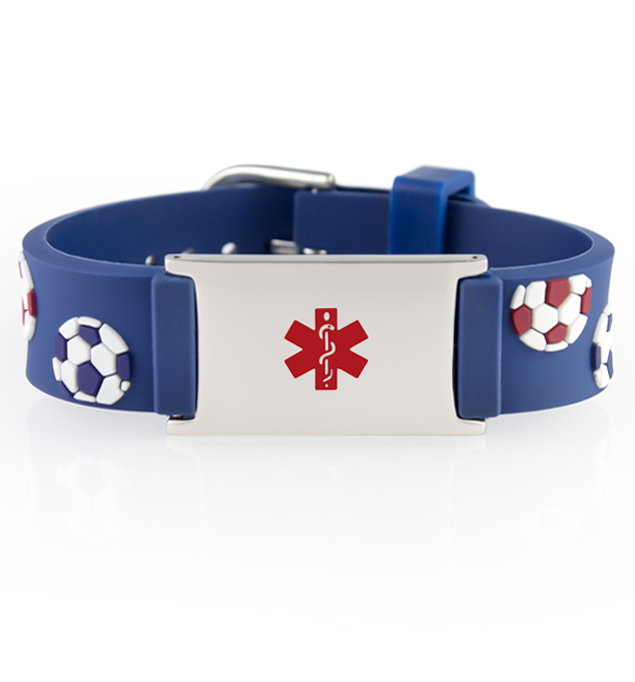 For the kid who eats, sleeps, and breathes soccer, we have the Soccer Ball Medical ID Band! A great choice for boys and girls, this navy blue silicone med alert band features raised, textured soccer balls with blue, red, and black accents. Comfortable and water-safe, this kids’ med ID is perfect for your little athlete. With a watch-style closure for easy clasping and size adjustments, the Soccer Ball Medical ID Band is one that can grow with your child. Opposite the clasp is a medical ID tag with a bright red caduceus symbol, designed to alert first responders to your child’s medical information, engraved on the back.